Life is full of little surprises, is it not? In Istanbul the last thing I expected to find was the first female Prime Minister of Great Britain. Of course, it was not the lady in the flesh. But it was quite a large photograph, and it was in the entrance to the city’s most popular tourist attraction. I suppose that, in 1988 – the date on the caption – Blessed Margaret decided that she wished to see Hagia Sophia (the Church of the Holy Wisdom, later a mosque and now simply an empty building of huge historical and architectural importance). Someone had a camera to hand then, and so did I now. 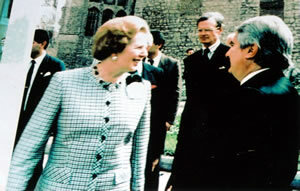 I am therefore able to bring you the image of Mrs Thatcher which greeted me in the Turkish capital. It shows her as smartly dressed (when was/is she anything else?) and smiling in the sunshine. On my own visit to Hagia Sophia, I imitated her in both respects. But I had a reason to be cheerful which was not available my distinguished forerunner: I was going that evening to dinner in the Four Seasons Hotel. 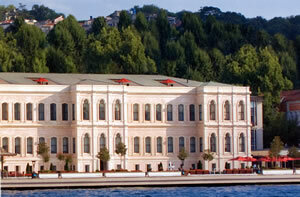 Istanbul has two Four Seasons hotels. This is good news, for I have yet to encounter a Four Seasons hotel which has not been smart and well run. 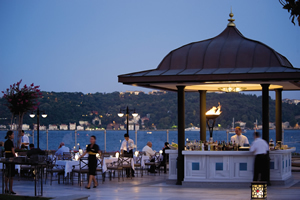 One Four Seasons is located very close to Hagia Sophia and the Topkapi Palace. I was heading for the other, newer establishment, which occupies a 19th Century Ottoman palace on the European bank of the Bosphorus Strait. ‘Aqua’, of course, means ‘water’. 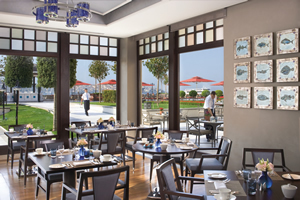 This is an appropriate name for the hotel restaurant, because (housed in the North wing of the palace) it overlooks the Strait, and its terrace goes right up to the water’s edge. Passing through the lobby and the bar, I was struck by that air of relaxed luxury and sophistication which is part of the style I expect in a Four Seasons hotel. In the dining room (which seats 95) it was there, too, created by soft tones of brown, white and blue. I settled myself in a supportive armchair (a cushion was brought immediately on request) with a white damask tablecloth in front of me and carefully placed spotlights overhead, and looked at my fellow diners. They constituted an affluent crowd, and I was pleased to observe that some of the gentlemen – like myself – had thought it right to wear a tie. My waiter, Semin, had a tie, too – a blue one, which made a pleasing contrast to his white shirt. This friendly fellow worked hard throughout the evening to ensure that the service I received was both correct and efficient. Chef de Cuisine Muhammed Hancabay cooks in a manner which is appropriate to these surroundings. The ingredients are of high quality and they are combined with subtlety and skill. Flavours are carefully balanced and the presentation is pleasing. There is nothing to disturb the horses about this menu. 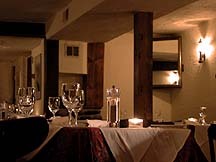 Indeed, given the atmosphere, the attentive service and the standard of the food, it would be very difficult not to have a pleasant time at Aqua. 160 offerings populate the wine list. Where appropriate, Mr Parker’s points for individual wine are given. As always, the prices reminded me that the Turkish government imposes a huge tax on foreign wine. The following ‘foreign’ bottles caught my eye: 2002 Cristal champagne (1,250 lira), 1998 Mouton Rothschild (3,975 lira), 2006 Ornellaia (1,375 lira) and 2001 Hertz Cellars cabernet (595 lira). 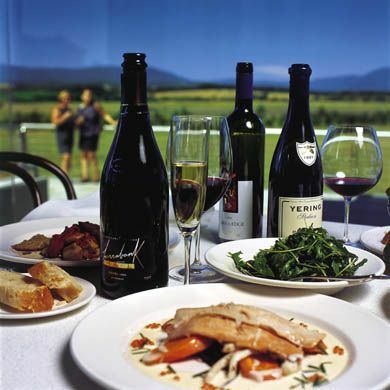 21 wines are offered by the glass, from which I chose a soft, fruit-laden Australian shiraz (Bin 50, Lindemans, 2001 – 18 lira). My bottle of red was from Turkey, a smooth, spicy and alcoholic cabernet (Reserve, Büyülübağ, 2006 – 145 lira), which demonstrated to me yet again that this is a country which can produce wines of serious quality. 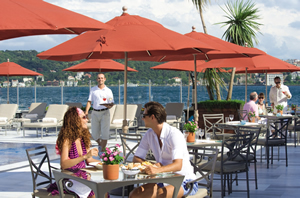 Four Seasons Hotel Istanbul at the Bosphorus, Çirağan Cad. No. 28, Beşiktaş, Istanbul 34349, Turkey.